Wow!! I can't believe how fast this past month has gone. I can't believe I made it through. I have to attribute it to good time management. I learned from the best - my mother-in-law, Bertha. Let's start back with a little background. It has been my good fortune to have three mothers. The first, of course, was my biological mother, Leola. The second was a good friend of my mother's, Ruth. Ruth had no children of her own so adopted those around her. There were dozens that she claimed as her own but more importantly there were dozens of kids who claimed her has their second mom. Finally there was my husband's mother. To me my mother was "Mother" and my mother-in-law was "Mom". I don't ever remember making a conscience decision to address them in these terms. It just happened. "Mom" was the best time manager I have ever known. She was a farm wife in northern South Dakota who did it all. All around the farm that is. In addition to the cooking, cleaning, child care and laundry, she had a big garden. Once a year she cleaned dozens of chickens for her freezer. She also got together with a neighbor lady to make kuchen for that same freezer. Their record was over 100 kuchen (a German coffeecake/dessert) in one day. She and Dad Haidle also processed their own beef, pork, ducks, geese and rabbits. I guess it was good for her - she lived to be almost 92. She was a prolific quilter. In her later years she quilted tops for others. In her spare time she loved crochet - afghans and dollies. She couldn't just sit. I don't recall ever seeing her without something in her hands. She hand-pieced while she waited for the potatoes to boil. She crocheted while visiting with family. She quilted while listening to the radio (later TV). My Mother taught me to make lists to organize my time. My Mom taught me to fill every moment with something from those lists. I miss them all so much. 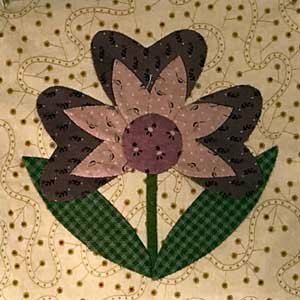 I am pleased to announce that beginning in January, 2018 I will be including lessons on my Quick Prep Applique Method. This has been a long time in preparation. Each month I will cover a topic in Quick Prep Applique. There will be a PDF file containing this information that you will be able to download. Last month I published a tip on appliqueing. This month I have included a tip in my Quiltmaker Road Tour Blog (see later in newsletter). Both of these tips were excerpts from these lessons. We will begin at the beginning with the tools and equipment you will need. I anticipate this series continuing for a couple of years at least. I really think you are going to enjoy learning the Quick Prep Method of Applique. Madelaine Leclerc - "Linda's Flutters and Flowers" or "Joy's Garden"???????? It never ceases to amaze me at the talent of my readers. Madeleine Leclerc of Quebec, Canada, is one. She is also no stranger to the pages of this newsletter. You have followed her as she has sent photos of "Linda's Flutters and Flowers". I was surprised that I didn't have a finished photo of this quilt to show you. Now I know why. She has been busy on the border. But not just any border. She took the border from "Joy's Garden". Fantastic!! It is such a wonderful uniting of these two patterns. Thanks so much for sharing, Madeleine. 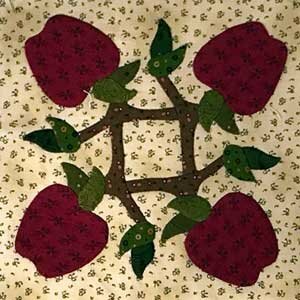 The Applique Society, also known as TAS has been a great inspiration to me. There newsletter (PDF format) helps keep me up to date on what is happening in the applique world. I can check out what TAS chapters are doing and best of all there is always as least one free pattern in each newsletter. There are a number of unique benefits to joining. 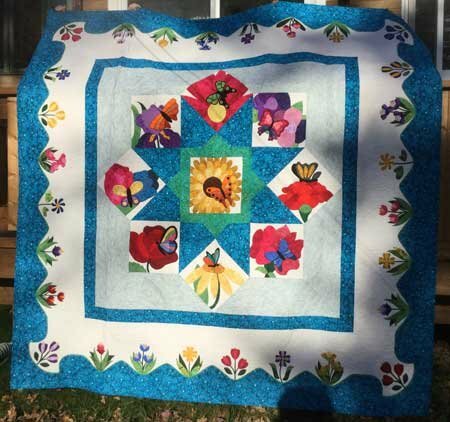 - Members receive a discount code at Keepsake Quilting. - Members receive a discount at JoAnn Fabrics Stores. - Members receive a discount at Interweave. where members share projects, information and more. A couple of years ago they re-orgainzed. As part of this process to simplify, they went to a once-a-year membership due system. They send out e-mails in April that your membership will be due in May. Everyone pays then. There is no prorating for memberships that are taken out during the year. However, the discounts alone can pay for your membership at anytime of the year. Click here to visit the TAS site. Sue Wolfgram - "Pushin' Up Spring"
Sue Wolfgram of Waukesha, WI has also had a block or two published in the past. Her version of "Pushin' Up Spring" may lack the border I put on mine but it is just as striking. It will be a wedding quilt for her niece. I would say that is one lucky couple. Beautiful job, Sue. 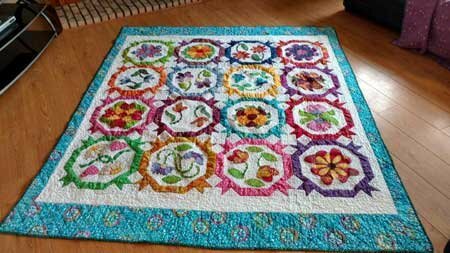 Do you enjoy seeing the quilts my readers make from my patterns? I'm sure they would love to see how you have interpreted my designs. Send me an e-mail and attach a photo of your project. I'll be delighted to share it with my readers. Click here to send me an e-mail. I'm pleased to report that my block " Fall Delight" (to the right) has been accepted for publication in Quiltmaker's 100 Blocks Vol. 16. The Tour Road Rally kicked off on Monday, Nov. 13th. Be sure to scroll down to find my block on Day 1. Or check out my blog by clicking here. I'm giving away seven patterns. As of the writing of this newsletter, only the first one has been given away. This is your chance to get one of my patterns free. 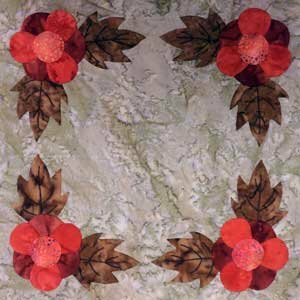 Also there is a very good tip on Quick Prep Applique in this blog. This blog tour is a wonderful way to meet the designers. I want to thank Quiltmaker for making this possible. You can still join the 2017 Tour Road Rally by clicking here. There will not be a December Newsletter. I will re-send this for those who miss it this month. I will begin a new, free BOM in January, 2018. I told the story of how I decided to make this quilt in last month's newsletter. (Click here to read it.) There are lots of photos of various blocks in that newsletter. You can see more blocks at the top of this newsletter and in this section of this newsletter. 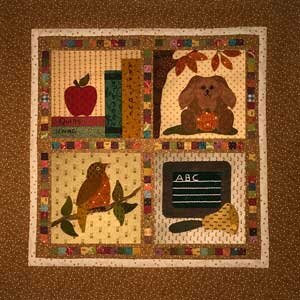 Select your favorite blocks to make 1 or more little quilts. I do have a confession to make. The little quilt to the right is a virtual quilt. I actually made the quilt with blank blocks. I then took photos of 4 of my blocks, cropped them and dropped them into the appropriate place on the little quilt. 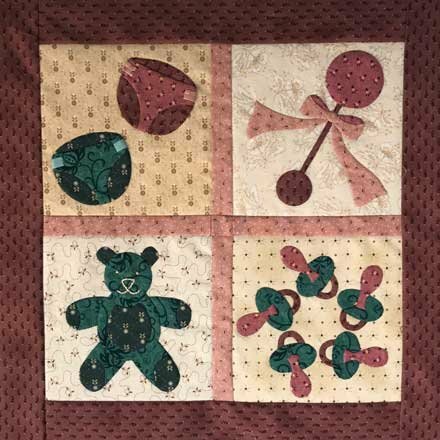 I did this after actually making the first 3 little quilts. I took apart the baby quilt (above) that I made first. This allowed me to re-use my blocks in my big quilt. I then made the 2 quilts in last month's newsletter. Once I had made these quilts I realized that I didn't want to take them apart. They were much too much work. But that meant I would have to re-make those 8 blocks. I have designed a total of 20 sets. I need to test those sets and decided to do so by making little 4-block quilts. 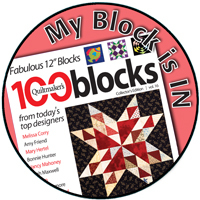 As I don't want to re-make 80 blocks I decided to make virtual quilts instead. The blocks have really been made by me as have the sets. They just aren't in the same quilt till I put them together in Photoshop..
How to get the next free BOM. 1. I will not be handling this free BOM as I have other free BOMs in the past. That is I will not be sending an e-mail with the address to the download page. Instead I will have one download page for the entire free BOM. That way you can bookmark it. 2. It has been very difficult to determine how often I should publish a pattern. I have asked for input from multiple sources. I have decided to publish one pattern every Monday morning. At this rate it will take 2 years to complete the BOM. This is quite problematic. I'm not sure we can retain interest for that long. However, it is applique and I need to allow you time to complete each block. However, to publish one block every two weeks would drag this out for 4 years. That strikes me as too long. We will start out with 1 block every Monday morning. It will be your responsibility to go to that page to download the pattern. Please click on the link. You will be taken to the download page. Save this link in your bookmarks. link on Monday Jan. 1 to receive your first free pattern. 3. Beginning January 15th, I will make published patterns available for purchase. That way if you miss a pattern you can purchase it. These patterns will only be $.50 (fifty cents). If you loose a pattern(s) or miss downloading some, please do not request the missing patterns from me. 4. I reserve the right to change the procedure for any reason. If I make any changes to the procedure I will notify you on the download page. I will continue to send a monthly newsletter but will post all notifications about the BOM on the download page. PLEASE let me know if we are moving too fast or too slow. I'm not locked into 1-a-week. 1 pattern will be published every Monday morning. It is your responsibility to go to the download page to download it. Each pattern will be available for 2 weeks. After that you can purchase it. It's been a long newsletter. I hope you have enjoyed it.